Many of us remember these famous statements made by Jesus “You must love the Lord your God with all your heart, all your soul, and all your mind” and “Love your neighbor as yourself” but I’m not certain many of us have poured much thought into what he says next. “The entire law and all the demands of the prophets are based on these two commandments”. 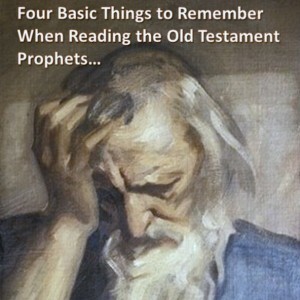 Jesus’ Bible was what we call today the Old Testament. Jesus in this passage calls the Old Testament “the law and the prophets”. I have already written an article in this series about what we need to remember when reading the laws of the Old Testament so now I would like give you some tips for reading the Prophets of the old testament. God made a covenant with the people of Israel. If you remember covenant basically means promise. God expected Israel to remember and understand their responsibility to be his promise-keeping covenant people as a witness to and a blessing for all the nations of the earth. God used prophets to speak for him to the people. The prophet would work as a kind of covenant representative. Their Job was to confront God’s people with the Word of God when Israel had failed meet their promised obligations as found in the Law. The Prophet in short was a kind of covenant cop. There are 16 Old Testament books written by these Prophets. Isaiah, Jeremiah, Ezekiel, Daniel, Jonah, Micah, Nahum, Habakkuk, Zephaniah, Haggai, Zechariah, Hosea, Joel, Amos, Obadiah and Malachi. Why are they called prophets? Were they foretellers and predictors of the future? Consider what Professor Gordon Fee has to say about this. Second: Don’t shoot the messenger! While reading the prophets you will often read the phrase “The Lord says” in some variation. So the prophet often speaks as if he is God. His job is to express the simple Mosaic covenants warnings and promises clearly to the people God has called him to go to. Here is an example of the prophet receiving a message. 25 “Was it to me you were bringing sacrifices and offerings during the forty years in the wilderness, Israel? 26 No, you served your pagan gods—Sakkuth your king god and Kaiwan your star god—the images you made for yourselves. 27 So I will send you into exile, to a land east of Damascus,[c]” says the Lord, whose name is the God of Heaven’s Armies.